and evil actions are all sin. I don’t like to admit this, but the reality is that I judged you. I looked at your skinny legs in your skinny jeans, at your fashionable tall boots, at the stacks of bracelets wrapping your slender wrists, at your taut, luminescent skin. I listened to your gracious southern drawls talking about intentionality and living life in grace and nurturing your precious babies and the holy calling of being a mama. I looked at your popularity—how many people you know, how many followers you have, which publishers you are with, what you have accomplished. You sang popular worship music and knew all the words and I made assumptions about your churches and faith. In short, I walked in with a judgmental, divisive spirit. You came in to the conference as empty vessels, preparing to be filled up. I lugged in bushel baskets of ugly. I looked through lenses of envy and jealousy. I let my longing to be better ignite my insecurities about my weight and age and the church background I come from. I assumed you weren’t interested in anything I might have to offer, so I held tightly to myself. I pride myself on my ability to look for similarities, to focus on what people have in common rather than dwelling on the differences. So I’m feeling especially appalled and ashamed that I fell so far and so quickly. True, I may be in my late 40s and you might be 23. I may have a muffin top and no excuses while you wear a FitBit and manage to work out even with a little one (or two or three or four). You may be especially stylish and I may feel frumpy. But since when has surface stuff mattered to me? And why did I let it consume me? Maybe it’s this: I sense that you are genuinely that selfless and gentle and kind, and I’m just not as nice as you are. And I don’t like it when I become—what was it Logan said?—Judgy McJudgyPants? And the more I didn’t like me, the more inferior I felt next to you. But when I took the time to fight through my feelings, when I turned again towards God and away from the master liar, I rediscovered the beautiful truth: We’re not that different. We both love God—love Him so much that He has become our source. We’re not in competition. We’re on the same team, and we’re representing the same Kingdom. We’re inspired by the same Source, and even so, we’re not meant to be exactly the same. 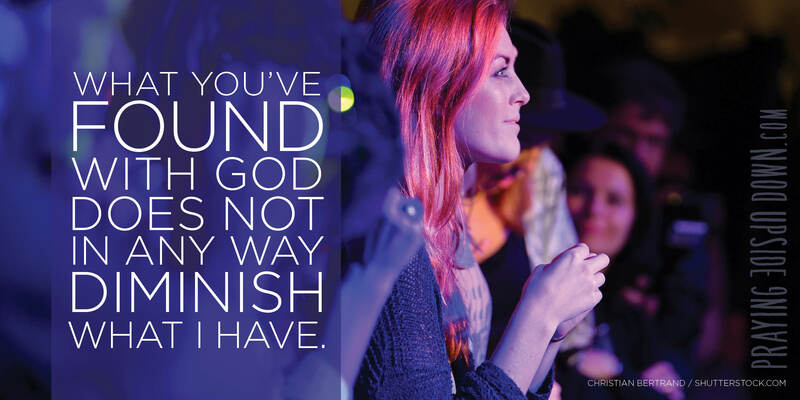 What you’ve found with God does not in any way diminish what I have found or what remains available to me. You will have stories I won’t, and you will use them to reach people I can’t. That’s good. It’s how it’s supposed to be. Forgive me for succumbing to the falsehood that there are not enough pieces of pie for each of us. Please grant me forgiveness for my ugly—and unfair and unfounded—thoughts. We all know the story of the woman at the well. She went in the middle of the day, alone, because she was an outcast. But Jesus met her there. He saw through her charade and spoke truth to the innermost part of her heart, and she discovered something in the water He offered that she had never found anywhere else. When I picture the women who taught us, I can’t shake this image: Women who draw their strength from the well of life, which is the Word of God. The idea that won’t leave me is that of each of you casting your bucket into the well with abandon—and withdrawing life-sustaining power. You don’t drink of the leftovers or rely on others to bring it for you. You lower your buckets and when you draw them back to you, they’re overflowing with living water, and you bathe in the overflow. Even more impressive, you go back again and again. And again. Because you can’t get enough. You’re not content to merely survive. You long to grow, to thrive. To live. I spent so much time dwelling on this idea that I missed something. Apparently, I am the woman who walked alone to the well, certain that I would be judged, and I almost missed taking a drink because I made such an idol of who I thought you would think I was. But you? You welcomed me with kindness. Your face shone with the reflected glory of God as you shared your stories. I spent a lot of time feeling like an outsider, but that’s not your fault. I could have gone to the well early in the morning, like the other women of the village. But I chose not to. The beauty of it all, though, is that Jesus still met me. He still waited and He still had something to offer. Because He always does. He whispers the truth of who He is, and who we are when we belong to Him. He reminds us that this life has nothing to do with other people and everything to do with Him. Period. I need to look upward, not sideways. I need to ask Him to change me, to help me learn to be content, to instill in me such a confidence in His love for me that I no longer measure myself against others. He sees me—with all the ugly on the inside—but He doesn’t run away. He pulls me closer and tells me the truth about myself. And reminds me what I already knew: I am forgiven. So now I need to forgive myself. I hope you will forgive me, too. I went into Allume focused on promotion and meeting people who could help me further my career. And boy did I miss the boat. Because this conference wasn’t about success, or even really about publishing. It was about nourishing the souls of women who write about God, about feeding the desire we each have to connect more deeply with Him through knowing others. And it was a learning opportunity. A place where God could show me my weaknesses in His ongoing efforts to prune me, to refine me, to redeem me and mold me into His image. I have a long way to go. But you know what? I’m feeling a surge of gratitude in my heart that I have the opportunity to walk alongside you on this path. I’m finally feeling what I should have felt from the start. I’m thanking God for the beautiful women He allowed me to connect with—in spite of my insecurities and inner turmoil. And I’m asking God to nurture you, to open doors and allow you prominent platforms from which to tell your God-stories. I’m praying for your success in publishing, and I’m trusting that God will reveal new things to you along the way. I’m in awe of your authentic relationships with Him and I’m inspired to renew mine. I’m pledging my help to you, in whatever ways I can, from a genuine desire to see you go forward, to see you change lives. It’s how I’m turning my prayers upside down today. With each pang of insecurity I feel, I’ll pray for all of you. And I believe that in the process, God will transform me. Because He’s good like that. Oh so good. And I’m so grateful. Friend…I’m so thankful for having met you. Your heart, your love for Jesus and above all your willingness to share boldly blesses me. More than anything thank you for teaching me to pray upside down!